Enjoyed your site. Had a photo and was attempting to determine value. 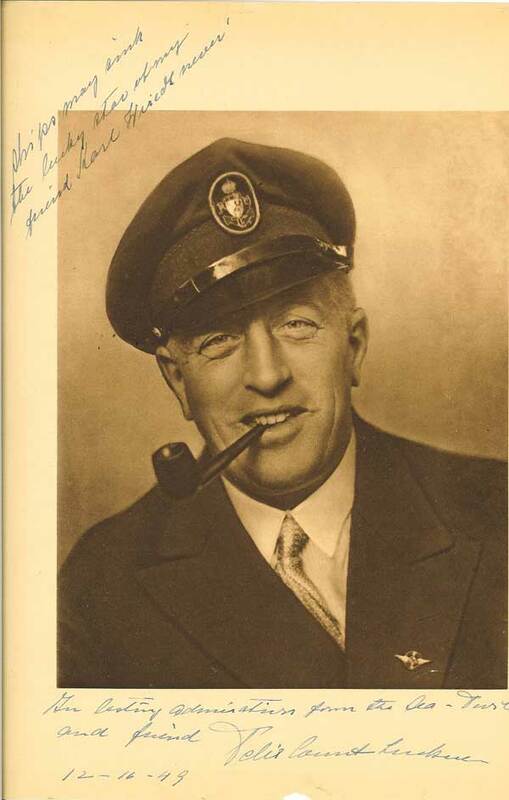 On December 16, 1949, Count Luckner came to Cleveland, OH in an effort to raise funds for German reconstruction. I don't recall for what specifically, but it was in the form of bonds. The fund-raising dinner was held at the Cleveland Hotel. My father-in-law, Carl Wriedt, was the chef who prepared the food. Carl was born in Hamburg, Germany in 1898. After the event was finished, Count Luckner was introduced to Carl. As with everyone else that the Count met, Carl and he became friends. The Count inscribed the attached photo for Carl (Karl). I thought you might like the picture if you don't already have it. I imported the photo into a Word Document and is attached as such. One more segment in the mosiac that makes up the von Luckner story, thank you for taking the trouble to write. I was unable to open the photograph file. Would love to get a copy so we may add it to our Von Luckner page on AHOY. Are you able to E-Mail the picture separately please?